Safety is key to enjoying a great cooking experience. Follow these simple tips during your journey of becoming a great chef! Wash hands and pop on a chef ’s hat before beginning to cook. Always have adult supervision when cooking. 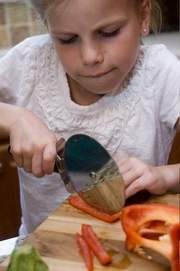 Use safe cutting tools like pizza cutters or scissors. Always have adults use the knives. Make sure you wash the vegetables or fruit before you use them. Use potholders to handle hot pots or cookie sheets. Wear an apron while you cook in the kitchen. Clean up as you go while you are cooking. Get all ingredients cleaned, chopped or measured before you begin to cook. This is known as “mise en place” which means put in place. Watch your fingers if you are using graters or peelers to grate your own cheese or peel your vegetables. Cook together frequently as a family. Apron Company Activity ~ Design an apron for you collection! Are The Tools Dishwasher Safe? What age group of children will enjoy the kits best? Do the Cooking’s Cool recipes accommodate for food allergies or intolerances? At this time, we do not have any special accommodations for allergies or dietary restrictions. Interested in selling Cooking’s Cool kits in your store? Where do you ship Cooking’s Cool kits? We ship in the United States and Canada at this time. How do I iron-on the Cooking’s Cool patches? Set Iron to cotton setting. Do not use steam and remove water from iron. Lay garment on a hard, heat tolerant surface. We suggest using a cutting board on top of the ironing board for a sturdier surface. Place iron-on side of the patch onto the fabric in desired placement area. Apply pressure over the patch approximately 30-60 seconds and keep the iron stationary. *lighter fabrics might require less time, heavier fabric might require more.